Under the guise of a bunch of cars burning tires, Formula Drift quietly built up the most powerful road race cars on the planet, and Fredric Aasbø’s new 1,000 horsepower rear-wheel drive Toyota Corolla hatch is one of the most extreme yet. We got an in-depth look and trust us, it’s batshit. Formula Drift’s 2018 season will mark the series’ 15th year of competition and it kicks off in just a few days in Long Beach, California. But before all that noise starts, Jalopnik got an exclusive tour of this new Papadakis build as it debuted beside the Corolla production car at the New York Auto Show. Except neither of these are exactly production cars; They’re pre-production vehicles, the only two of their kind in the country. 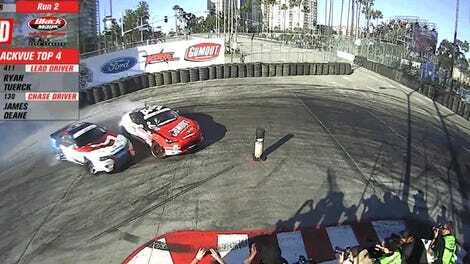 That one went to a drift team shows how legit the sport has become. As is the specialty of Papadakis Racing, the car (officially branded the Rockstar Energy Drink / Nexen Tire Toyota Corolla Hatchback) has been converted from the front-wheel drive layout of the car as it rolls off the assembly line to a rear-wheel drive setup. Key parts from a MKIV Supra make that possible, along with a serious amount of bracing so the car doesn’t twist itself into a pretzel doing something it was never designed to do. Oh, and it has 1,000 nitrous-boosted horsepower from a four-cylinder Toyota 2AR economy car engine. Aasbø (possibly still sore from jumping Supras on a frozen lake) and team owner Stephan Papadakis took us around the car and chatted about how it was built and what they wanted out of it. I was just floored that such a thing could come out of a plain-Jane econobox like the Corolla hatch.